"The first thing to note about Ben Meyer is not his polite Midwestern manners, his oh-so-Portland uniform of stocking cap, flannel shirt and scruffy beard or that he's opened two restaurants in what were then—and still are, to some extent —underserved areas of the city. It's not even that he's been interviewed by the likes of Forbes and the Wall Street Journal wanting to hear about the local pasture-raised beef and pork he features on his menus. 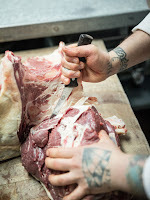 The key to Meyer is that this evangelist for whole animal butchery, whose walk-in is chock-full of large cuts of dry-aged beef, spent 10 years as a vegan." Since the time I wrote those words three years ago for the Oregonian, the scruffy beard has come and gone (and come and gone again), the stocking cap and flannel shirt can vary with the season and his two restaurants are still putting out luscious plates of grass-fed meat and farm-raised vegetables. And this former vegan-turned-omnivore is still intent on upending a system he sees as intrinsically unhealthy for his family, his community and the environment. 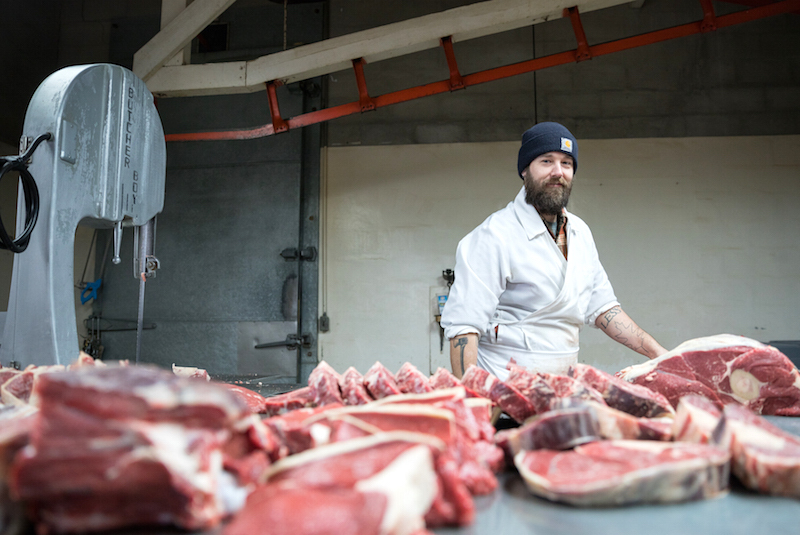 "I always say that Old Salt and Grain & Gristle are a food system," Meyer said. "We buy raw ingredients from people and we turn them into all the products that we use, [like] grains that are custom-milled to turn into the breads and contract tomatoes where I give the seed to the farmer and they grow it out for us." But in his latest venture he's diving deeper into the stream that our food travels in getting from the field to our plates. 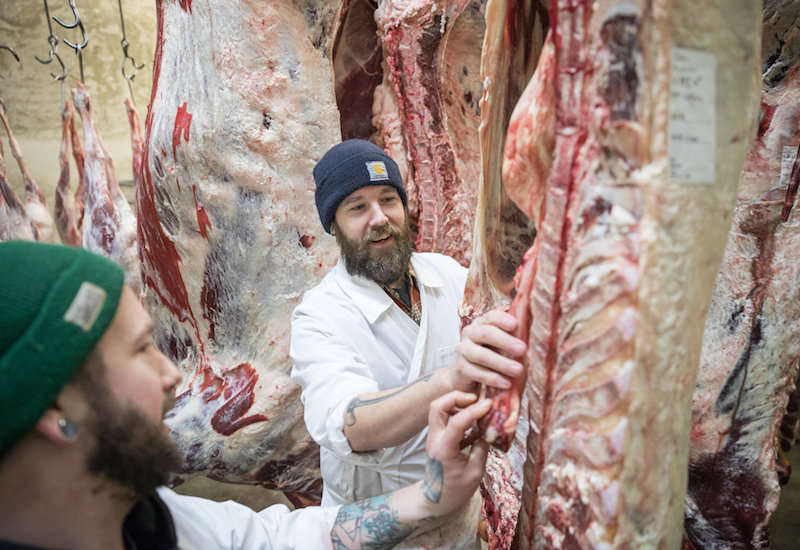 With partners Jimmy Serlin and Ryan Ramage, his Revel Meat Company is attempting to bring local meat back to local tables, in the process revitalizing a nearly extinct local meat processing industry that enables small farmers to bring their animals to a market hungry for the kind of meat they raise. Bringing local meat to market. In the spirit of upending the status quo they tossed around the idea of calling their venture Revolution Meat, or saluting the history of Marks by calling it High Mark Meat, but then Serlin suggested Revel Meat for what he thought of as a gustatory celebration of the best the region had to offer. The name stuck. 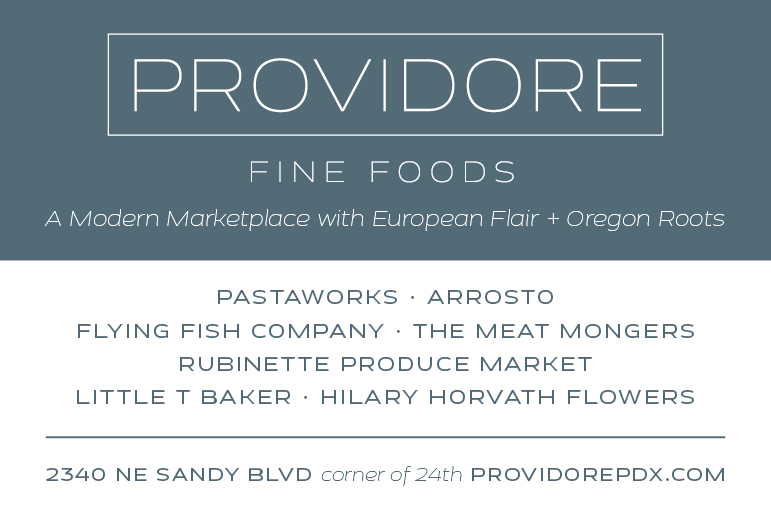 An unusual part of this new venture is that Meyer isn't just branding all the meat they process under the Revel Meat banner, regardless of the source. According to a 2015 article, discussing the practice of "localwashing," many large processors, like Carlton Farms in Oregon, buy animals from Canada or elsewhere, bring them to their facility for slaughter and processing, then brand the products with their name. Meyer's plan for Revel Meat is to have the name of the ranch or farm that raised the animals follow the product, whether it ends up as hamburger or sausage or charcuterie, all the way to the consumer. "My whole goal with all food is getting rid of the smoke and mirrors," he said. "We want to make sure that if somebody’s buying it, they know who they’re buying it from, the name of the ranch and where it is. We’re not going to co-brand it; it’s not just going be Revel Meat pork, it’s going to be Payne Family Farms pork delivered by Revel Meat." Jimmy Serlin, a happy man. 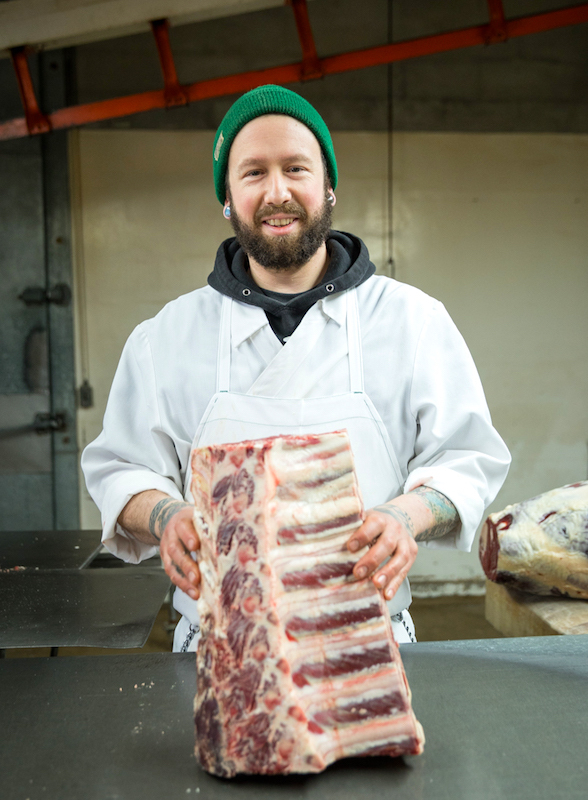 Since Meyer and Serlin are both chefs, they are intimately connected to Portland's restaurant community and have already begun wholesaling their meat products like sausages to some of the city's restaurants. But entering the wholesale business has meant adding layers of complexity to an already complicated process. In the normal course of running his restaurants, Meyer said, he would talk to his ranchers a week ahead for pork and two weeks or more for beef so that the animals would be in the pipeline to go to the processor. They would then hang for two to three weeks, after which he would butcher and process them for his menus. With wholesaling, not only does he need to have pork in hand to make the sausage in time to get it to restaurant chefs for their menu, he said, "I now have to plan weeks out to make sure that we have pigs lined up to get them killed, cleaned, hung up, turned into sausage, packaged, labeled and then driven up to the city. It’s just a whole other layer back." As if that wasn't enough, the partners are adding animal husbandry into the mix, raising their own animals on two parcels of land near the facility. It means working not weeks or months, but years out, he said, with animals on the ground that are slated to come through their process two years from now. But even with intimidatingly steep learning curves on multiple fronts, this former vegan never wants to forget that he is responsible for taking the life of a living creature. "My biggest fear is that you would become callous and not care," Meyer said. 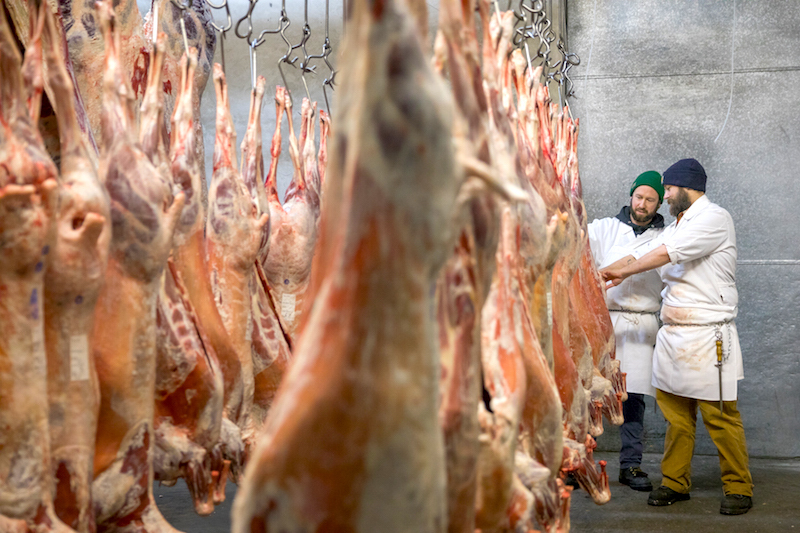 It's why he chose to take on the challenge of revitalizing a medium-sized, locally owned slaughterhouse that would serve small farmers and ranchers, rather than scaling up to operate at the same volumes as larger processors. "You can imagine the level of care when you’re killing 340 head an hour on five different lines," he said. "That’s stunning an animal every 3.2 seconds or something. That is factory work where the cog happens to be a living creature. That is the most mortifying part to me." "No matter how much love or care you put into the raising of an animal, if that’s how it finishes its life, you’ve broken that covenant with the animal," he added. "That covenant is the most important thing for us. If you break your part of the covenant, then we’re asking that species, this pig or that beef or these sheep or goats, to keep their end without us keeping ours. It’s not fair." Read the other posts in this series, Rejuvenating Local Processing and Transitioning a Family Business. Thanks, Throwback. I'm very impressed with their operation and the collaborative, appreciative relationship on both sides. If you do take your animals there, I'd be interested to hear your experience from the producer side. Please keep in touch! hi, love the concept and the follow through with the collaboration from all sides... I love it when people are shown where their food comes from. my only concern is with the fabulous beards in the coolers and processing room pictures - where are your beard nets to keep your scruff outta my burger! :) Love what you are doing!